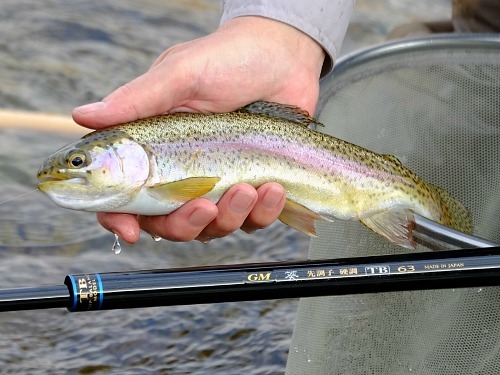 The Suntech GM TB rods are new this year and are unlike any keiryu rods I've seen before. The TB does not stand for TenkaraBum. It stands for Top Balance. The rods are definitely tip action rods. 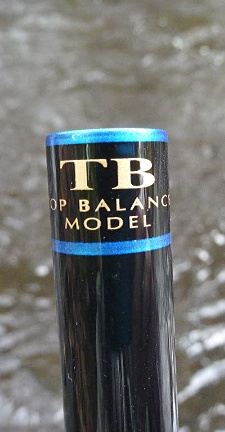 It is always hard to decipher Google translations of Japanese rod descriptions, but I take the Top Balance name and Suntech's description to mean that the soft tip sections balance out the stiff middle and lower sections. For those familiar with the Suntech Genryu Sawanobori, this rod is like it - only more so. I often get asked for a recommendation of a good rod for Euro nymphing. 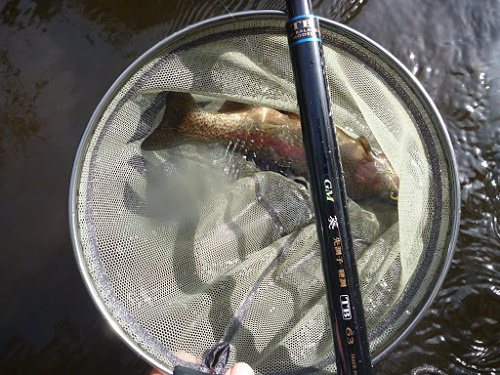 Hint: most tenkara rods are not very good for Euro nymphing - particularly when using one or more heavy nymphs, what used to be called Polish or Czech nymphing. Their midsections are too soft to get good hook sets when fishing heavy nymphs deep. Over the past few years, I have gradually changed my views of what makes a good Euro nymphing rod. I used to think that a stiff rod was best, but email conversations with anglers who have used both stiff and soft keiryu rods have brought me around to the belief that fish will hold onto an artificial nymph longer if they do not feel tension on the line. The anglers reported that with a stiff rod they felt the take, but by the time they could react the fish was gone. With a softer rod and either markers on a keiryu line or a sighter on a tenkara line, they saw the take before they felt it, and could react before the fish spit out the fly. So how do you balance the need for a softer tip so the fish doesn't feel line tension immediately with the need for a firmer midsection to get good hooksets with heavy flies fished deep? Suntech's solution was to put a soft rod tip on a firm rod. It's not just the one tip section that is soft - the upper two or three sections are pretty soft, transitioning into a very firm midsection. It is a smooth transition, but it is a pretty quick one. I am sure Suntech did not have Czech nymphing in mind when they designed the rod. It is clearly a bait rod, but the problem is common to both real nymphs and artificial nymphs. Trout will spit out either one if they feel tension on the line, but if you fish in deep, fast water, you need a firm midsection to get a good, quick hook set. Several years ago I fished New York's Esopus river on a day when the water was a bit high and the weather was a bit windy. With the heavy current and the wind I had to use much more weight than I normally do. Back then I had a Daiwa Zero rod and with it I had a devil of a time. The Suntech GM TB 63 would have been a better choice. I could have fished with more weight to get my red wiggler closer to the bottom and still had enough backbone in the rod to get good hook sets. The first time I did get to fish with the Suntech GM TB 63 was on the White River in Arkansas last March. As advertised, the strike detection was easy and the hook set was positive. The markers didn't budge until a fish hit, but when it did they dipped sharply. I immediately raised the rod tip and it was fish on! Vern Berry, who was on shore and taking photos (hand held with a long telephoto, by the way!) 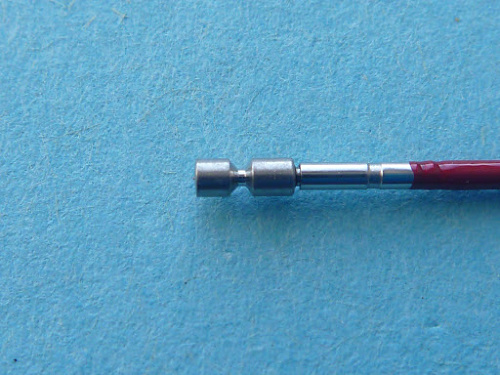 reported that he had never seen a rod that only bent in the upper quarter of the rod before. It isn't really quite that extreme, and it does work! The uppermost portion of the rod was soft enough for the markers to dip sharply and the midsection was firm enough to set the hook even though I was fishing pretty deep. The rod is firm enough to fish heavier weight in deeper water but it doesn't take a large fish to register a strike. This little wild brown was caught this past October in one of the the suburban streams just north of the New York City. I know it's wild because the state doesn't stock them that small. Although the rod tip is soft enough to allow good strike detection even with small fish, the middle and lower sections of the rod are stiff enough that it is way more rod than you would need for fish this size - unless you are lantern fishing. You could indeed use the GM TB 54 or 63 for lantern fishing, fishing with a line so short that to bring in a fish you have to collapse the rod. Lantern fishing rods need to be stiff because Japanese anglers lift the fish out of the water while they collapse the rod. Even with a small fish, the rod has to be stiff to be able to lift the fish when the rod is fully extended out over the stream! 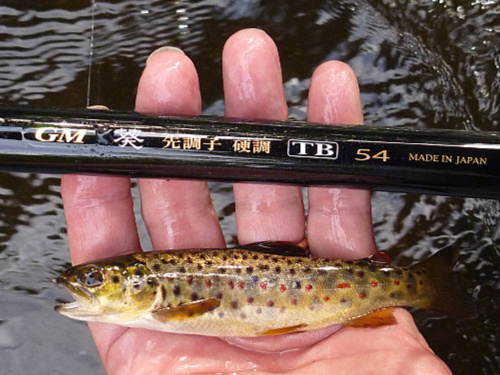 What you couldn't use the GM TB 54 or 63 for is tenkara fishing. 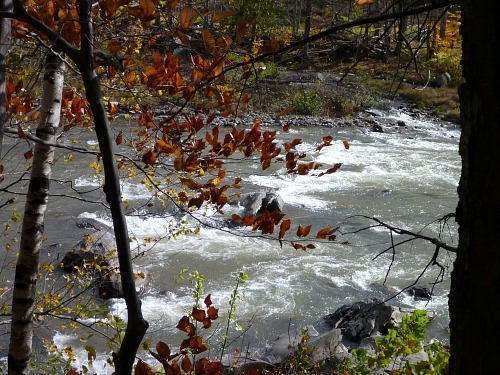 Most keiryu rods will cast a tenkara line well. The Suntech GM TB 54 and TB 63 do not have the right bend profile for that. 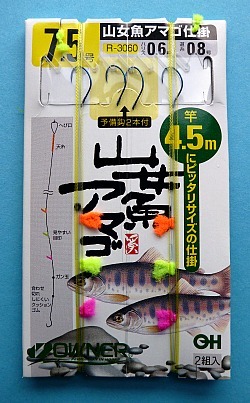 You could use them for keiryu fishing in heavy water, you could use them for fishing heavy artificial nymphs (Polish or Czech nymphing) but you can't cast a tenkara line well with them. Another reason they are not ideal for tenkara fishing is the lack of a lillian. 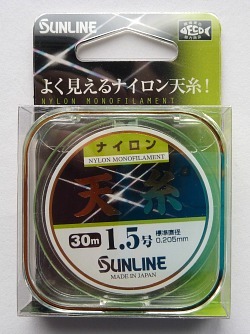 Several of Suntech's keiryu rods do not have lillians. You can attach a very light line, like a size 2.5 to any of them but with this rod I do not think you would be able to cast a size 2.5 line. The attachment mechanism works beautifully with the Sunline Tenjo line and a girth hitch, though. If you are fishing heavily weighted nymphs I would definitely recommend a keiryu line rather than a tenakara line anyway! 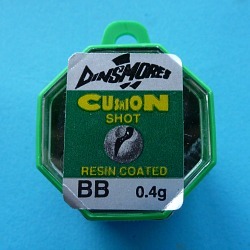 It is much easier to move the markers to adjust for depth than it is to change tippet length or to bury part of your sighter in the water and hope it doesn't alert the fish. The markers are easy to see and extremely sensitive. When using a rod with a soft tip, they'll dip easily when a fish takes. When using a rod with a firm midsection, you can get good hooksets even when fishing deep.